Summary: How do we nurture intellectual curiosity, prepare students for a global economy, and validate and celebrate students’ cultures, language diversity and multiple literacies in an era of accountability and high stakes testing? The authors offer suggestions for ways teacher leaders can be advocates for equitable education and promote responsive practices for all students in spite of pressure from language and educational policies. This article could be a useful piece to read as part of a professional development series or study group on assessment and English learners. It is our experience that when teachers honor both oral and written home languages in school, they validate the child’s point of power in learning; thus, academic investment is most likely to occur. Then students are willing to understand that Standard English is the language of social capital and the importance of adding it to their already-sophisticated home language. They have the resources to transfer their mastery of their home dialect or first language to the task of learning a new language. Ortiz-Marrero, Floris Wilma, and Karen Sumaryono. 2010, July. 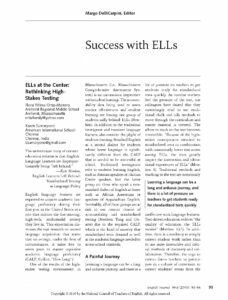 “Success with ELLs: ELLs at the Center: Rethinking High-Stakes Testing.” English Journal 99 (6): 93-96.